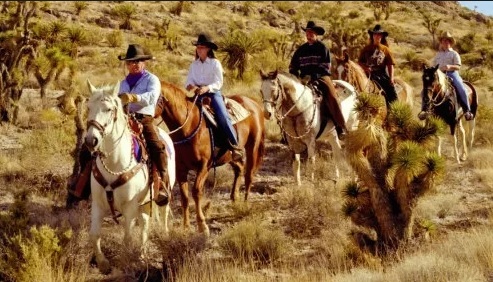 Best Price Guarantee | Vegas.com: If you purchase your tickets via the links provided on this page and find a better price for Wild West Horseback Adventures, Vegas.com will match the competitor's price and refund the difference. That’s customer care you can count on. Authentic western-style breakfast with eggs, flapjacks, bacon, sausage, and orange juice. The Maverick adventure begins with a rise and shine pick-up at your hotel. Your arrival at the ranch will be just in time to enjoy an authentic western-style breakfast. Our ranch hands will then pack the horses and get ready to show you the ride of your life. You’ll be surrounded by peace and serenity with majestic views of nearby mountains and breathtaking views. This is for the rider who doesn’t mind waking up early to start the day reminiscent of the cowboys that made the American West famous, this ride is just for you! After your trail ride we will take you into our cowboy town, and petting zoo. Approximately 5 hours after departure. Helmets are available for use by all riders if requested and are free to use on the ride. All children 12 years old and under will be required to wear a helmet on this ride.Children must be 6 years and older. Please note: Due to the nature of this tour, we are not able to accommodate riders weighing more than 250 pounds. Pregnant women are not permitted to ride.